The Valjoux 7730 is a hand-wound, dual-register chronograph movement produced from 1966 to 1973. The 7730 includes a small seconds sub-dial at 9:00, a jumping 30-minute counter at 3:00, and a central seconds counter. With no date complication, the crown moves between just two positions, a refreshingly simple configuration. Originating as an alternative to column-wheel chronographs, the 7730 employs an affordable cam-switching system that helped to democratize the chronograph watch during the middle of the last century. The Valjoux 7730 served as the basis for customized, rebranded movements from the likes of Breitling, IWC, and Panerai, while stock 7730s wound up in watches from brands so obscure that the movement is the most recognizable thing about them. Search eBay for “Valjoux 7730” today and you’ll get a smattering of sporty 1960s and 70s chronographs from minor players like Briel, Exactus, and LIP up through better knowns like Hamilton, Clebar, and Zodiac; the latter now carry the caché and high price of having been built by Heuer. Even Sears & Roebuck sold 7730-loaded chronographs made by Heuer under the unimaginative brand name “Tradition.” As for their own chronographs, Heuer used the 7730 sparingly in their Autavia Ref. 7763 and Carrera 7753, though column-wheel movements like the Valjoux 72 (which use different Ref. #s) are just as common in those models. Along with the tangled taxonomies of modified and rebranded Valjoux 7730s, the acquisition-and-merger bonanza among Swiss movement manufacturers during the 20th century has further muddled the 7730’s history. The short version is that the 7730 started as the Venus 188, which ran from 1948 until 1966 when Valjoux absorbed Venus and changed the movement’s name to Valjoux 7730. Aside from the name, Valjoux changed nothing until 1969 when slight hammer modifications gave rise to the identically spec’d 7733 and its variants with date (7734), 12-hour counter (7736), and 10-minute regatta countdown (7737), all containing parts interchangeable with the original 7730. Confusingly, the 7730 stayed in production co-currently until 1973, likely the year when the old-style hammers were finally used up. The slightly modified 7733 and its variants only lasted until 1978. All were victims of the Quartz Crisis. Despite the writing on the wall, Valjoux also produced a self-winding version of the 7733 called the 7750 from 1974-1975, making enough of them that year to last a full decade of continued quartz ascendancy. As interest in mechanical watches surfaced again, Valjoux brought the 7750 back in 1985, and it has remained the world’s most popular mechanical chronograph movement to this day. You can read more about the Valjoux 7750 here. Despite this labyrinthine lineage, nearly all unmodified 7730s have “7730” stamped on them, and it’s safe to assume that the stamp indicates a stock movement made between 1966 and 1973. Those wishing to collect earlier versions should look for Venus 188s, while those interested in later models should look at the 7733, 34, 36, 37 and, of course, the automatic 7750. Because they have been the norm for decades, it’s difficult to imagine a cam-shifting chronograph movement as a radical development. However, during the 1940s, when column-wheel systems were still the standard, the far cheaper cam-shifting Venus 188 helped give rise to a seemingly endless diversity of affordable chronographs while simultaneously promoting the column-wheel to eminence. While there are valid technical explanations for the superiority of the column-wheel mechanism (especially when coupled with a clutch activator), cam systems remain to this day the affordable workhorses they were intended to be. Culturally speaking, the cam-shifting chronograph movement helped democratize the chronograph. During the relatively affluent 1950s and 60s, alpine skiing was racing toward its boom in the 1970s, with the Alps as the ultimate destination. A stereotypical Austrian and Swiss alpine aesthetic was swept up into an international outdoorsy nostalgia that popularized chalet style architecture, traditional Swiss sweaters, après-ski fashion, fondu, and endless reproductions of The Matterhorn. Then as now, nothing symbolized Switzerland as well as chocolate and watches, and one could commemorate a trip to Switzerland (or to one of the new resorts in N. America like Aspen or Vail) with a sporty, yet affordable, chronograph from Chronographe Suisse or one of the countless labels they were making watches for. It’s been estimated that between the end of WWII and the onset of the Quartz Crisis in the 1970s there were as many as 500 different labels offering watches containing outsourced cam-shifting chronograph movements. 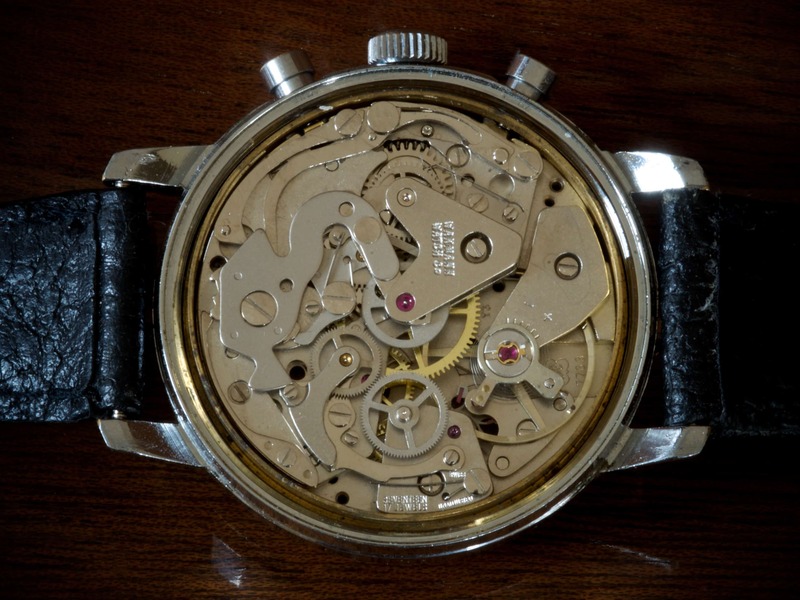 Between watches housing the Venus 188, the Valjoux 7730, and comparable movements from Landeron and Lemania, millions of cam-shifting chronographs were sold during the post-war decades. The cam-shifting chronograph also slotted into what we now call mid-century style. Casual khakis, polo shirts, sneakers and cardigan sweaters (often with a pipe and cocktail in hand) were coming to dominate men’s fashion—all helping to complete a full-on rejection of the war-beaten Victorian codes that had persisted in the US and Europe. Along with jazz, abstract expressionism, ironic literature—and maybe even a little weed smoking and socialism on campus—the trappings of bohemia were going mainstream. In this shifting context, chronographs (and dive watches to a lesser degree) helped one declare his widening personal freedoms, easy-going style, and jet-setting adventurism (however real or imagined). All this set the stage for Paul Newman and Steve McQueen to rise during the 1970s as the coolest (if not fastest) chronograph-and-cardigan-wearing car racers on and off screen. Newman and McQueen fast became fashion templates for regular guys looking to play similar roles in their own lives, and a cheap chronograph was an ideal accoutrements. Whether mountain-mad or car-crazy, these young, sporty, male clients were snatching up cam-shifting chronographs so fast that the bigger watch houses couldn’t ignore the trend. Breitling serves as an example. In 1964 they introduced their Top Time line of chronographs, at first housing Venus 188s and then Valjoux 7730s and its variants. As Willy Breitling himself put it in their press release: “We are sweeping into the field of youth and we are going to speak their language. [W]e are designing a superb range of ultra modern chronographs, led by a completely new model, the Top Time.” Cam-shifting movements allowed Breitling and others to target this thriving, lower-end market. Watches with 7730s in them ran large for the era. It can be hard to imagine a 36mm chronograph as a large watch, but in the middle of the last century 36mm and up meant major wrist-presence. These chronographs were also decidedly casual and sporty (even the gold-plated ones) compared to the increasingly thin and tiny dress watches of the time. Nonetheless, watches containing the 7730 and its kin were still thinner than those with vertical column-wheel movements, and this difference may have helped the cam-loaded chronographs seem more wearable at a time when 33mm was a common men’s watch size. The Valjoux 7730’s story exemplifies how simultaneous developments in technology and culture can intertwine to form new horological DNA. While column-wheel chronographs of the last century now stand as monuments to high craft, cam-shifters like the 7730 represent a down-to-earth, democratic ideal that, in many ways, feels similar to the spirit of today’s micro-brand boom. That spirit lives on in the Valjoux/ETA 7750, with the only slow down coming from the Swiss government’s anti-monopoly regulation, itself a sign of how vastly popular these movements remain to this day.